Furniture made with a skateboard to use as a footrest, stool or simply as a decoration element to decorate all types of modern spaces and reflect the skater inside. If you are looking for a gift for a sportsman and sport lover especially skate, this article will surely be a perfect complement to your living room or room. 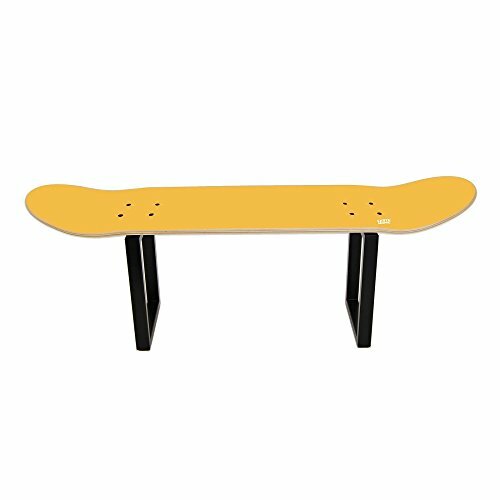 We are facing the ideal furniture to give a birthday or Christmas to a skater, a useful, personalized product and perfect size to carry from one side to another of the house. They have as many possibilities as people who want to use it, so it does not have a consumer prototype. The non-comply skateboard stool / footrest is made of black lacquered steel feet. The mounting of this stool is very simple, it is like putting on a skateboard, soon it will be ready to be used in your house. As for the maintenance of the stool does not require great attention, since with a cloth you can leave it as new. Surprise this year with a very original gift for the most skaters. Skateboard stool made of original skateboard deck. Customize your home with furniture that reflect your lifestyle.